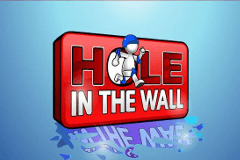 The “Bring on the wall” catchphrase spouted by Peter Dickson was a stalwart fixture of Saturday evenings in 2008 and 2009 as the Hole in the Wall game show had the nation in stitches, and now you can try to navigate your way through the wall without burning a hole in your pocket! For those of you who partied away your Saturday evenings rather than being glued to the box, Hole in the Wall only aired for two series but was an adaptation of Japanese game show Brain Wall which saw celebrity contestants compete in two teams (Red v Blue) to position themselves in the shape of a hole in a polystyrene wall that moves towards them in front of a swimming pool – and should they fail to match the shape they took a swim, with the winning team seeing £10,000 donated to their chosen charity. Like most TV-themed slots from Fremantle, the Hole in the Wall slot machine contains 5 reels and 20 paylines with generous betting ranges from 20p to £500 but it’s the animations and bonus features that really see the slot burst into life. The original tune also rings out as the reels are spun and the symbols shrink a little before expanding on screen as you click the spin button. While many players have criticised the symbols that feature in the Hole in the Wall slot machine, I must admit that I quite like them. They are big, bold and a lot of fun just like the TV show. The main symbol is the Wild which is simply a wall with the word WILD cut out from it and, how online slot machines work in most cases, it possesses the ability to substitute for all others aside from the two special symbols – plus if your luck is really in and you land five on one payline you’ll scoop a 10,000x win. There is a Scatter symbol which is a film reel with the word Replay printed on it, along with the Hole in the Wall gameshow logo which is the Bonus symbol – more on these later. The most valuable standard symbol is the avatar with red helmet and the word Clear printed which means the wall has been navigated successfully with five of these on a line paying out 1,000x. Next up are avatars that represent the Red team and the Blue team, each of which pays 500x for five on a line, while there is also a Blue avatar holding onto a banana and a Red avatar who is bouncing on a space hopper, with standard Ace to Jack playing cards completing the line-up. Replays were a common occurrence in Hole in the Wall and Fremantle have incorporated this nicely into the slot machine. Each and every time you land three or more Scatter symbols (Replay) in any position on the reels, you’ll be rewarded with one free spin. Don’t scream in anguish just yet though, as while it’s only one free spin rather than the usual ten we are used to seeing in free spins mode, the reels keep spinning until you land a win, and as mentioned it does occur very regularly so they certainly add up! A slot based on the gameshow wouldn’t be complete without you having to navigate your way through some weird yet wonderful holes, but firstly you’ll have to land three or more of the Hole in the Wall Bonus symbols to get a chance to stand in front of the swimming pool! This second screen bonus game sees you select one of three avatars with an initial bonus amount stated and then it’s time to ‘bring on the wall’ – three of them in fact. You simply need to move the avatar left or right so that it is lined up with the hole in the wall, with your multiplier bonus increasing each wall that you navigate through – it’s very easy and very rewarding! Just like the TV show, the Hole in the Wall slot machine is very entertaining - but better yet it is also extremely rewarding. Available to play at all online casinos for UK players that offer Fremantle slots, it boasts fun graphics, upbeat sounds, a frequent free spins feature, but best of all the second screen bonus game where you navigate an avatar through three walls for huge multiplier wins!